The holidays seem to be peaking around the corner. It's pretty common that around winter holidays, many people buy or receive some new clothes. 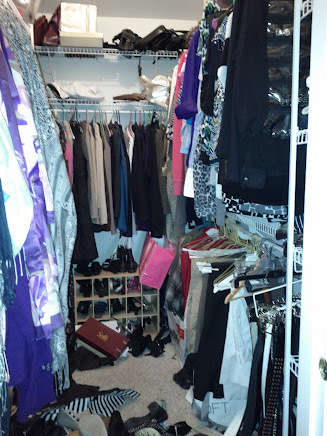 With that in mind, it's probably time to weed some things out of your closets (and dressers) to make space for those new clothes, new styles, and eventually, a new year. What pieces to you actually wear? Most women (and many men) keep "someday" clothes. "Some day I'll be this size again." Maybe. Probably not. Unless you are currently working to change your body size, realistically assess how long it has been since you fit into that size. A month? Okay, maybe you should hang on to some pieces for a while. A year? Time to say goodbye. Chances are, if you are that size again, fashion will have changed. "Someday I might need a piece like this." Perhaps. Again, be honest with yourself. How long since you've needed a formal gown? Since your career changed, have you ever worn a business suit? And so on. Make sure the items you're keeping are comfortable and fit how you'd like them to. Ask yourself if you wore it this season or remember wearing it last season. If an item from last winter still has the tags on it, you should probably donate it. Same with things new from this past summer. 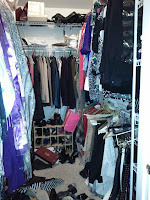 If you have pieces that need repairs or dry cleaning and you haven't had the motivation to fix it, donate them. If it's been ___ amount of time since it needed attention, it hasn't been priority enough or fit into your lifestyle to care for it. Pass it along to someone else who might like to give attention to this item. 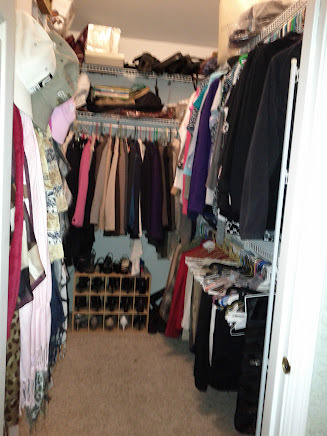 Once clothes are donated and space created, set up the new closet! Group like items. This could be by season (winter, summer) or by style (tanks, long sleeves, pants, skirts, dresses). You know how you dress, so you can set it up however it makes sense to you. Some prefer to color code as well. I like to do this within the categories. For example, color code the tanks, then color code the dresses separately. Other items: make sure there's a particular place to keep accessories: shoes, hats, belts, scarves. These items all need a home to live, as well. Don't forget to have a bag or hamper available for laundry and dry cleaning. Feel free to use baskets, bins and the like to help catch these loose ends. And, of course, get things off the floor! That's how those piles get started! Hang things up. Fold them on shelves or in drawers. Get shoe racks or bins. Now, you're ready to dress for all those holiday parties!